A common question that we have gotten from customers over the years is how to differentiate parts of their site to look and function uniquely. For example, “I want to have a Wedding section on my site, with it’s own unique menu items and design, separate from the Newborn section of my site, is that possible?” In prior versions of ProPhoto, hacky workarounds could be used to “sort of” pull it off. But they were a lot of work and rarely achieved what a customer was really wanting. In ProPhoto 6, we’ve made this totally possible by way of a new feature called templates. Each template is simply a saved set of customization settings that you can apply to any page type, or individual page that you want. And you can create as many templates as you’d like! 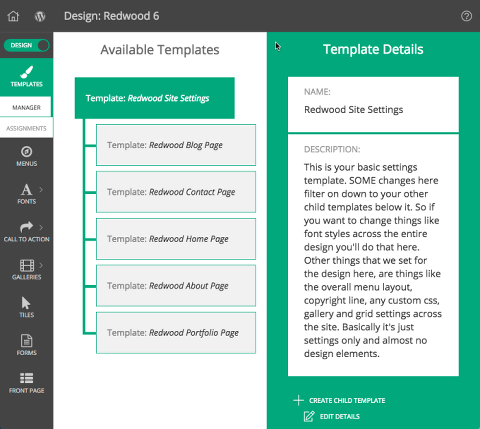 Using the power of templates, you can create completely different layouts and apply them to different areas of your site, allowing you to basically create multiple sites within one. But templates can also be used for more subtle changes as well. For example, if you have just one particular page where you want to add a sidebar column that runs alongside your content, you can create a template to do this and apply it to just that one page, without affecting any other pages on the site. Whenever you want to create a new template in ProPhoto, all you need to do head to the Template Manager area. There, you can create copies or children of existing templates. If you create a copy of a template, it is just that, a copy that you can edit however you’d like, separate from the template that you copied it from. A child template on the other hand will still inherit all of the settings from the parent of which it is created. That way you can make changes to just the parent template and they will flow down to all of the child templates automatically. This is very helpful where you are wanting templates that share many common elements, but maybe have just a few slight variations. 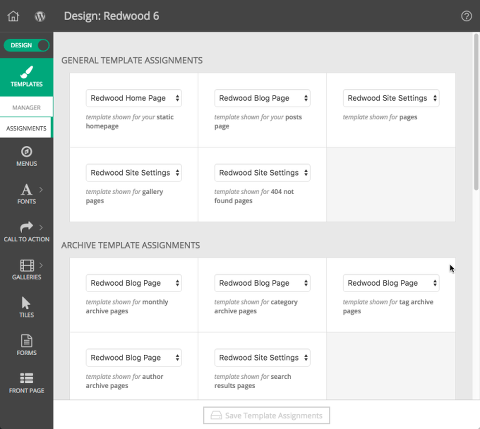 To assign templates to your site, you can do it very easily right within the Template Assignment area. This area allows you to assign any template you’ve created to any particular page type on your site, like individual post pages, category archive pages, etc. 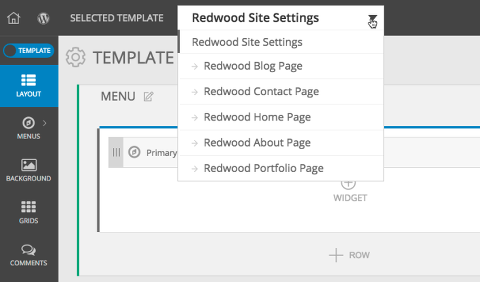 Or, if you want to get even more detailed and assign templates to individual pages specifically, you can do that right within the WordPress page editor.